PART USED : Bark, Seeds and Flowers. In the Ramayana, one of the books of Hindu mythology, there is mention of Ashoka tree. Ashoka means "without sorrow", a reference to this bark's reputation for keeping women healthy and youthful. Buddha was said to be born under this tree. HABITAT: Saraca Indica is grown all over India. It occur upto the altitudes 600 metres. 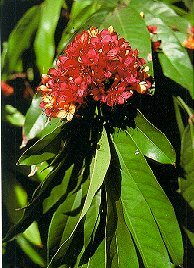 It is cultivated in many gardens because of its decorative orange red flowers and evergreen beautiful foliage. BOTANICAL DESCRIPTION: Leaves are narrowly lanceolate 15.25 cms long cork like at the base and with a short petiole. Stipules are intra-petiolar and completely united. Flowers are fragrant. They are 7.5-10 cm across Calyx is yellow to orange and finally red. Its stamens are 7 to 8. The filaments are filiform. The bark of saraca indica is distinguished by presence of wartyprotuberances on its outer surface. BENEFITS OF ASHOKA: Its use in treatment of excessive uterine bleeding is extensive in India. The plant is used also in dysmenorrhoea and for depression in women. depression, bleeding hemorrhoids, uterine fibroid,considered a uterine sedative and tonic. Useful in Leucorrhoea. PHYTOCHEMISTRY: The bark contains tannin, catechol, sterol, and organic calciumcompounds. PHARMACOLOGY: Oxytocic activity of the plant was seen in rat and human isolateduterine preparations. Estrogen-primed or gravid uterus was more sensitive to the action of the alcoholic extract. ASHOKA SIDE EFFECTS: In the commonly used doses side effects are rare. Ashokarishta : 15 - 30 ml b.i.d. / t.i.d. Ashokkwath : 15 - 30 ml b.i.d. Seed powder : 1 - 3 gms b.i.d. Flower powder : 1 - 3 gms b.i.d. Ashokghrita : 5 gms b.i.d.